A concept test in qualitative advertising research elicits reactions from respondents in focus groups or depth interviews. You can use it to evaluate seven elements in advertising. There are seven elements in persuasive ads. Each element is important. They work together to persuade and convince. The headline is the most important part of the ad. Its purpose is to grab attention and get people to read, watch, or listen to the rest of the ad. If the headline does its job, it attracts interested people and gets them to pay attention. If the headline fails, it loses people and sales. Headlines have a few seconds to grab attention. So, they must be powerful. Good headlines promise specific benefits, strike emotional chords, stir up curiosity, and ignite urgency. Use a concept test to assess headlines. After the headline, the ad promises important benefits. People buy features and benefits that satisfy personal emotions and beliefs. The ad shows people enjoying the benefits. It describes or shows a picture of users achieving emotional goals… happiness, health, admiration, knowledge, success, wealth. The emotional benefits are the outcome of the functional benefits. Keep in mind, positive emotions outsell negative emotions. Happiness, curiosity, surprise, and acceptance are positive. The ad also proves claims and sets up credibility. A well-known brand may be proof enough. An unknown brand works harder at proving. An unknown brand offers testimonials, specific features, and extra incentives. It must build trust. The ad also distinguishes the product or service. It positions the product against competitors and describes the unique selling proposition. The ad makes an offer. An offer shows value. It cements desire. The ad’s call to action tells people what to do next. It tells them how to buy. The call to action is specific and clear. Often, it includes incentives to incite immediate action. Persuasive ads are deceptively simple, yet they follow a proven formula, tested over the span of a hundred years in advertising. Apply the seven elements of persuasive ads in your marketing communications. 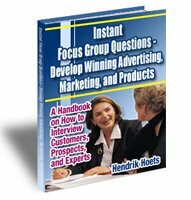 Test to evaluate ads in focus groups or depth interviews. Test each of the seven elements in an ad. Test ads to find winners. Test to understand concerns. Testing concepts avoids expensive mistakes.